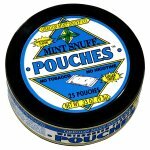 Original Mint Snuff Pouches-Peppermint. Long-Lasting Breath Refreshment and Healthy Alternative To Cigarettes and Chewing Tobacco. Extremely Strong Peppermint Flavor. Fixes Garlic, Coffee, Cigarette, and Caveman Breath! Actually comes with a warning: “You may wish to allow time between Pouches to avoid Mint-Discomfort”. Pop-A-Pouch Instead of a Puff! $3.00 per can. 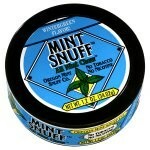 Wintergreen Flavor Mint Snuff Pouches. New Longer-Lasting Flavor * New Formula is NOT Sugar-Free* Freshens Breath and is a Healthy Alternative To Cigarettes and Chewing Tobacco. $3.00 per can. Original Mint Snuff Non-Tobacco CHEW. Great-Tasting chew made of mint instead of tobacco. Healthy Alternative To Cigarettes and Chewing Tobacco. $3.00 per can. Wintergreen Flavor Mint Snuff Non-Tobacco CHEW. Great-Tasting chew made of mint instead of tobacco. Healthy Alternative To Cigarettes and Chewing Tobacco. $3.00 per can. Cinnamon Flavor Mint Snuff Non-Tobacco CHEW. Great-Tasting chew made of mint instead of tobacco. Healthy Alternative To Cigarettes and Chewing Tobacco. $3.00 per can. 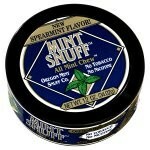 Spearmint Flavor Mint Snuff Non-Tobacco CHEW. Great-Tasting chew made of mint instead of tobacco. Healthy Alternative To Cigarettes and Chewing Tobacco. $3.00 per can. 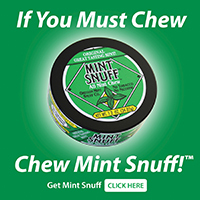 Beaver Chew is our Non-Tobacco Mint Chew made with a blend of Peppermint & Spearmint Flavors. Click Here To See Larger View. Great-Tasting herbal chew made of mint instead of tobacco. Healthy Alternative To Cigarettes and Chewing Tobacco. $3.00 per can. UPS Blue/2 Business Days to Continental U.S. 48 States is $25. (Business days are Monday-Friday – excluding weekends and Holidays.) Alaska & Hawaii ship US Mail $7. Canada $10. Orders received before 9am Pacific-Time usually ship out that business day. 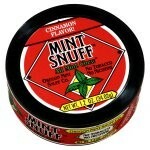 For Mint Snuff Retail Store Locations and More Info. Click Here! Please e-mail any comments, suggestions, or how we might better serve you to kim@mintsnuff.com. Customer Service is available by phone M-F, 9a-5p Pacific Time 1-800-EAT-MINT * 1-800-328-6468 Thank you for your business.